Enzymes are incredibly efficient and highly specific biological catalysts . In fact, the human body would not exist without enzymes because the chemical reactions required to maintain the body simply would not occur fast enough. Think about the soda you drank moments ago before hitting the books. The sugar in the soda was converted to CO 2 , H 2 O, and chemical energy within seconds of being absorbed by your cells, and this chemical energy enabled you to see, think, and move. However, the 2.2-kilogram (5-pound) bag of sugar in your kitchen cabinet can sit for years and still not be converted to CO 2 and H 2 O. The net reaction (glucose 6 O 2 → 6 CO 2 + 6 H 2 O) is the same in both cases, and both pathways are thermodynamically favorable. However, the human body speeds the overall reaction through a series of enzyme-mediated steps. The key is in the catalytic power of enzymes to drive reactions on a time scale required to digest food, relay signals via the nervous system, and contract muscles. How do enzymes do what they do? They create an environment to make the reaction energetically more favorable. This environment, the active site , is typically a pocket or groove that is lined with amino acids whose side chains bind the substrate (such as sugar) and aid in its chemical transformation to products (see Figure 1). Therefore, the amino acids that form the active site provide the specificity of substrate binding and the proper chemical environment so that the reaction occurs more rapidly than it otherwise would. Enzymes are central to every biochemical process that occurs in the body. Most enzymes are proteins . There are exceptions, however. For example, there are catalytic ribonucleic acid (RNA) molecules called ribozymes that are involved in RNA processing, and, in 1994, the first DNA enzyme was engineered. Although no naturally occurring deoxyribozymes have been identified, these laboratory-generated DNA enzymes are being developed as therapeutic agents to fight infectious disease and cancer. All enzymes are characterized by having a high degree of specificity for their substrates, and they accelerate the rate of chemical reactions tremendously, often by a factor of a million times or more. Most enzymes function in the cellular environment at mild conditions of temperature, pH , and salt. There are few nonbiological catalysts that can be so efficient in this type of environment. Enzymes play a critical role in everyday life. Many heritable genetic disorders (diabetes, Tay-Sachs disease) occur because there is a deficiency or total absence of one or more enzymes. Other disease conditions (cancer) result because there is an excessive activity of one or more enzymes. Routine medical tests monitor the activity of enzymes in the blood, and many of the prescription drugs (penicillin, methotrexate) exert their effects through interactions with enzymes. Enzymes and their inhibitors can be important tools in medicine, agriculture, and food science. Figure 1. The active site is a groove or pocket on the enzyme surface, into which the substrate (here, a glucose molecule) binds and undergoes reaction. Enzymes exhibit four fundamental characteristics. First, enzymes do not make a reaction occur that would not occur on its own, they just make it happen much faster. Second, the enzyme molecule is not permanently altered by the reaction. It may be changed transiently, but the enzyme at the end of the reaction is the same molecule it was at the beginning. Therefore, a single enzyme molecule can be used over and over to catalyze the same reaction. Third, an enzyme can catalyze both the forward and the reverse reaction. One direction may be more favorable than the other, but the unfavorable direction of the reaction can occur. Fourth, enzymes are highly specific for the substrates they bind, meaning they catalyze only one reaction. Take a look at Figure 2. Note that glucose (C 6 H 12 O 6 ) in the presence of oxygen (6 O 2 ) will generate carbon dioxide (6 CO 2 ) and water (6 H 2 O). The forward reaction from glucose to the top of the energy hill to carbon dioxide and water at the base is energetically favorable, as indicated by the "downhill" position of the products. Because energy is released, the forward reaction sequence is called exergonic. Conversely, to synthesize glucose from CO 2 and H 2 O requires energy input to surmount the energy hill and drive the reaction in reverse; therefore, glucose synthesis is called endergonic. Figure 2. An energy profile for the glucose reaction. An enzyme (green) enhances the reaction rate by lowering the amount of activation energy required to boost the reactants to the transition state at the summit of the energy barrier. Every biochemical reaction involves both bond breaking and bond forming. The reactant molecules or substrates must absorb enough energy from their surroundings to start the reaction by breaking bonds in the reactant molecules. This initial energy investment is called the activation energy. The activation energy is represented by the uphill portion of the graph with the energy content of the reactants increasing. It is the height of this hilltop that is lowered by enzymes. At the top of the energetic hill, the reactants are in an unstable condition known as the transition state. At this fleeting moment, the molecules are energized and poised for the reaction to occur. As the molecules settle into their new bonding arrangements, energy is released to the surroundings (the downhill portion of the curve). At the summit of the energy hill, the reaction can occur in either the forward or the reverse direction. Look again at Figure 2. The products CO 2 and H 2 O can form spontaneously or through a series of enzyme-catalyzed reactions in the cell. 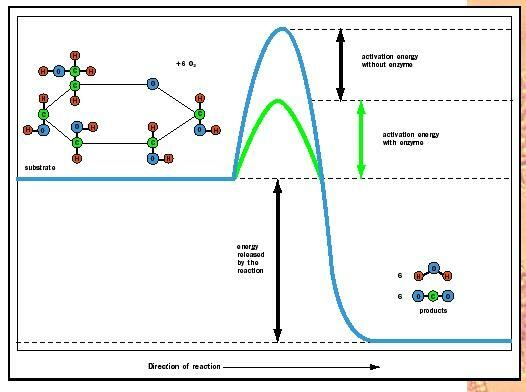 What enzymes do to accelerate reactions is to lower the energy activation barrier (green) to allow the transition state to be reached more rapidly. What is so special about the active site that allows it to accomplish this goal? Several mechanisms are involved. Proximity Effect. Substrate molecules collide infrequently when their concentrations are low. The active site brings the reactants together for collision. The effective concentration of the reactants is increased significantly at the active site and favors transition state formation. Orientation Effect. Substrate collisions in solution are random and are less likely to be the specific orientation that promotes the approach to the transition state. The amino acids that form the active site play a significant role in orienting the substrate. Substrate interaction with these specific amino acid side chains promotes strain such that some of the bonds are easier to break and thus the new bonds can form. Promotion of Acid-Base Reactions. For many enzymes, the amino acids that form the active site have functional side chains that are poised to donate or accept hydrogen ions from the substrate. The loss or the addition of a portion (H ) can destabilize the covalent bonds in the substrate to make it easier for the bonds to break. Hydrolysis and electron transfers also work by this mechanism. Exclusion of Water. Most active sites are sequestered and somewhat hydrophobic to exclude water. This nonpolar environment can lower the activation energy for certain reactions. In addition, substrate binding to the enzyme is mediated by many weak noncovalent interactions. The presence of water with the substrate can actually disrupt these interactions in many cases. Enzymes can use one or more of these mechanisms to produce the strain that is required to convert substrates to their transition state. Enzymes speed the rate of a reaction by lowering the amount of activation energy required to reach the transition state, which is always the most difficult step in a reaction. The first ideas about substrate binding to the active site of an enzyme were based on a lock and key model, with the active site being the keyhole and the substrate being the key. When the right substrate entered the active site, catalysis occurred because the substrate was perfectly complementary to the active site. This model described some enzymes, but not all. For others, binding leads to conformational, or shape changes, in the enzyme active site to enhance the bond breakage and formation required to reach the transition state. In both models, the active site provides the tightest fit for the transition state, and the substrate is drawn into the transition state configuration as a result. Figure 3. Temperature and pH profiles. Each enzyme has an optimal pH and temperature that favor the native conformation for maximum activity. degrees Celsius, the enzyme degrades because the noncovalent interactions that stabilize the native conformation of the enzyme are disrupted. 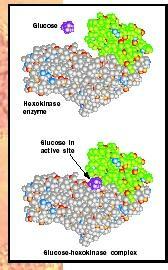 The enzyme in essence falls apart, and the active site is no longer able to function. In contrast, the optimal temperature for enzymes of the thermophilic bacteria (extremophiles) that live in hot springs is quite high at 70 degrees Celsius (158 degrees Fahrenheit), a temperature that would instantly scald skin. Enzymes also show a pH range at which they are most active (see Figure 3). The pH effect results because of critical amino acids at the active site of the enzyme that participate in substrate binding and catalysis. The ionic or electric charge on the active site amino acids can enhance and stabilize interactions with the substrate. In addition, the ability of the substrate and enzyme to donate or receive an H is affected by pH. 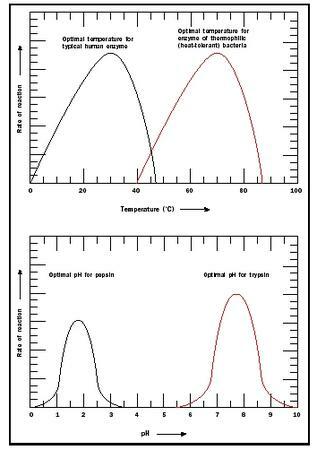 The pH optimum differs for different enzymes. For example, pepsin is a digestive enzyme in the stomach, and its pH optimum is pH 2. In contrast, trypsin is a digestive enzyme that works in the small intestine where the environment is much less acidic . Its pH optimum is pH 8. Cofactors and Coenzymes. Many enzymes require additional factors for catalytic activity. The cofactors are inorganic such as the metal atoms, zinc, iron, and copper. Organic molecules that function to assist an enzyme are referred to as coenzymes. Vitamins are the precursors of many essential coenzymes. Cofactors and coenzymes may remain at the active site of the enzyme in the absence of the substrate, or they may be present transiently during catalysis. Allosteric Inhibitors and Activators. In addition to the active site where the substrate binds, an enzyme may have separate sites, called allosteric sites, where specific molecules can bind to increase or decrease the activity of the enzyme. The allosteric inhibitors and activators bind the enzyme through weak, noncovalent interactions and exert their effects by changing the conformation of the enzyme, a change that is transmitted to the active site. Typically, the allosteric modulators regulate enzyme activity by affecting substrate binding at the active site. Although biochemical reactions are controlled in part by the specificity of substrate biding and by allosteric regulation, the human body could not function if all enzymes were present together and all operating maximally with no regulation. There would be biochemical chaos with substances being synthesized and degraded at the same time. Instead, the body tightly regulates enzymes through metabolic pathways and by controlling specific enzymes within a pathway. This approach allows an entire pathway to be turned on or off by simply regulating one or a few enzymes. Metabolic pathways can also be regulated by switching specific genes on or off. Compartmentation. One of the major characteristics of eukaryotic cells is the presence of membrane-bound intracellular organelles . These structures help to segregate specific enzymes and metabolic pathways, especially when the pathways are competing with each other. For example, the enzymes that catalyze synthesis of fatty acids (a type of lipid ) are located in the cytoplasm , while the enzymes that breakdown fatty acids are located in the mitochondria . Figure 4. Feedback inhibition. Many metabolic pathways can be down regulated or turned off by an end product acting as an allosteric inhibitor of an enzyme earlier in the pathway. 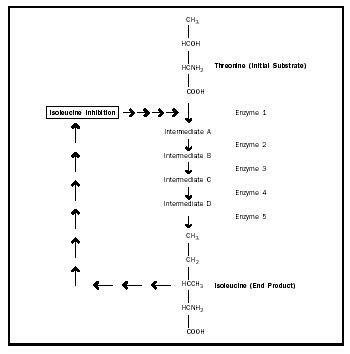 In this example, the product, isoleucine, inhibits the first enzyme in the pathway, threonine deaminase. they are activated by removing or cleaving off a small portion of the protein. This "proteolytic" cleavage to activate an enzyme is irreversible but serves an important function to prevent the digestive enzymes from digesting the pancreas. Allosteric Regulation. Allosteric modulators can increase or decrease the activity of an entire metabolic pathway by altering the conformation of a single enzyme. Sometimes, the end product of the metabolic pathway acts as an allosteric inhibitor by binding to the enzyme at its allosteric site, causing a conformational change in the enzyme to decrease the activity of the enzyme. This type of regulation is called feedback inhibition (see Figure 4). Cooperativity. Frequently, enzymes are multisubunit complexes with more than one active site. Binding of the first substrate molecule may lead to conformational changes that are communicated to the other subunit(s) such that the binding of each additional substrate molecule is enhanced. Positive cooperativity can amplify the response of enzymes to substrates and provides an additional mechanism to regulate enzyme activity. Finally, enzymes can be thought of as nanomachines, powering the reactions of the cell to enable the human body to be the entity it is. There is a special class of enzymes called molecular motors that drive all the movements that occur in the body, including muscle contraction (myosin/actin), flagella and cilia beating (dynein/microtubule), and vesicle movements in neurons (kinesin/microtubule). These molecular motors harness the energy from adenosine triphosphate (ATP) to drive actin-based or microtubulebased movements. Breaker, Ronald R. "Making Catalytic DNAs." Science 290 (2000): 2095–2096. Campbell, Neil A., Jane B. Reece, and Lawrence G. Mitchell. Biology, 5th ed. Menlo Park, CA: Benjamin/Cummings, 1999. Deeth, Robert J. "Chemical Choreography." New Scientist 155 (1997): 24–27. Koshland, Daniel E., Jr. "Protein Shape and Biological Control." Scientific American 229 (1973): 52–64. Madigan, Michael R., and Barry L. Marrs. "Extremophiles." Scientific American 276 (1997): 82–87. This page was very helpful. I am a freshman in high school, and was looking for something that was easy and relatable to understand. I recommend this website to everyone in high school and above.